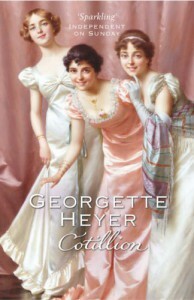 Review: Cotillion by Georgette Heyer - Romance, Adventure And Random Moments. I love, love, love, Freddy!!! He is one of my top (if not THE top) Georgette Heyer heros. Surprised that's how I feel? Freddy isn't your average GH hero, he is a pink, NOT a rake, NOT a nonsuch and certainly NOT 'in the petticoat line'. He is quite simply everyone's friend but no ones crush. His cousin Jack (Who IS a rake, IS a nonsuch and is VERY much in the petticoat line) thinks he's amusing in the way that you might find a kitten or puppy amusing. Which effectively made me hate, hate, hate Jack for the rest of the book! Because the thing about Freddy is that he tries REALLY hard and make's things work out right. He isn't suave, he isn't able to just swan about and fix everything effortlessly, and I loved him for it! The happy endings he managed to salvage out of horrible tangles where all the better because he'd given his all to make it happen. And being ready to take a bashing for your girl, even when you know without a shadow of a doubt your gonna be beaten to pulp, makes a true hero. A nonsuch would have known he was going to win, and therefore his willingness would not be as brave.